ORIENTIQUE FLORENCE DRESS - Sobidah Clothing Co.
SKU: OR51537. Categories: Boutique, Clothing, Dresses, Womens Fashion. This Orientique Florence dress is super soft to wear and in the coolest fabric. 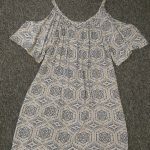 it is lined and has an asymetrical hemline with border pattern. Waist is elastized for comfort and has rope belt that can tie back or front. Lovely party dress or dress up for the races. This Skirt is 100% cotton and reversible.